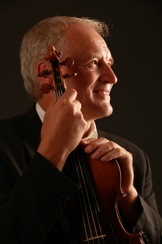 Jaroslav Šonský is an outstanding violinist and professor with Czech background living in Sweden but also in the Czech Republic. He studied at the Prague Music Academy (HAMU) with Prof. Alexander Plocek. During the years following his diploma he took part in many master courses, among others with Prof. Semyon Snitkovsky and Prof. Menahem Pressler. Mr. Sonsky himself was later teaching at master courses in both Canada and Brazil but also in Europe. Jaroslav Sonsky has given concerts in 24 countries in Europe, North and South America, Asia and Africa. He has performed at several important festivals – and also at very prestigious occasions, i.e. for the Swedish king and at a concert for presidents; at the last visit in Germany by president Vaclav Havel. He has received the honourable price Gratias Agit given by the Minister of Foreign Affairs of the Czech Republic for his long time unselfish activities and promotion of Czech music and culture worldwide.